May I welcome you here this evening and on behalf of the people of Thetford and the surrounding area, welcome you to our community as part of the East Meets West activities. To our Japanese friends present; Kon’nichiwa. Yokoso. Myself and Thetford Town Council are delighted that flint is being recognised in this way and excited to learn about the similarities and differences with obsidian. Flint has long been a part of our heritage, our culture and more visibly of course our architecture. Melissa Hawker (Ancient House Museum of Thetford Life, part of Norfolk Museums Service) Jan Summerfield (English Heritage), and Simon Kaner (The Sainsbury Institute for the Study of Japanese Arts and Cultures). 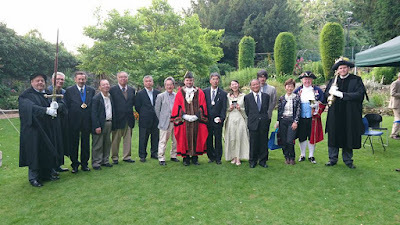 The Brecks-Nagawa Exchange Committee, the Centre for Japanese Studies, University of East Anglia, Norwich; Meiji University, Meiji University Center for Obsidian and Lithic Studies; Nagawa-machi Obsidian Museum; University of Tokyo, Faculty of Humanities, Thetford Town Council, the Young Obsidian Ambassadors and their supporters and Ancient House Teenage History Club. Particularly thanks to our own Councillor Armes for providing the food this evening. – Since the year 631 there’s been a seat of learning on the site of the Grammar School – originally this would have been a religious foundation and a place for sons of the wealthy to be educated. It’s also a place where flint was used as well! The monastic houses across the Town would have drawn pilgrims interested in ecclesiastical learning and prayer from across the country. - And Thetfordians themselves have never been afraid to assist others with learning as well, even when occasionally they didn’t want to learn. Thomas Paine of course was born in Thetford in 1737 and sought to educate through his various writings including ‘Common Sense’ and ‘the Rights of Man’. I was very honest at Grimes Graves yesterday evening and admitted that I had in fact not been there previously. In my defence, Thetford is so rich in heritage I’ve clearly just been learning about all the other stuff in the my 30 years. So no, I’ve not been knapping… there’s a lot to take in. East Meets West continues and develops further that culture of learning. Today Thetfordians continue to make their mark on the world by cross cultural partnerships and embracing the spirit of partnership. The worlds first twinned Archaeological sites are evidence of that. 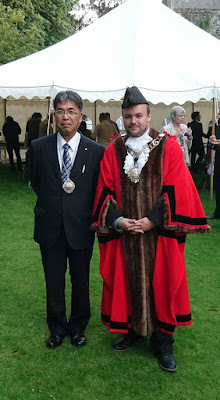 Yesterday Deputy Mayor Mr Saito kindly gave my an obsidian pendant which I have been wearing today alongside my Mayoral chain. I’d like to return the favour and present a flint themed gift to him this evening. I hope the remainder of your stay with us is enjoyable and interesting.